The European Space Agency's Mars Express has captured fresh images of the planet's surface indicating the existence of a massive lake in the red planet's past. 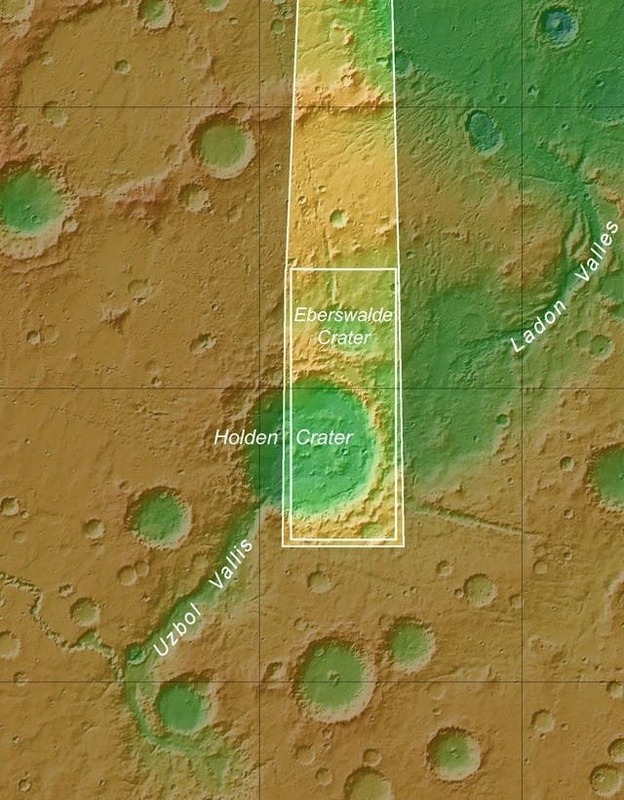 Contained in the Eberswalde crater, the lake's existence was theorised after the Express caught images of a delta on Mars' surface. The delta discovered was a large fan shaped pattern believed to have been formed by deposits within the now dry ancient lake. The crater believed to have housed the lake is estimated to be around 65 km in diameter, with the accompanying delta spanning 115 square km. The delta is thought to have formed more than 3.7 billion years ago when an asteroid hit Mars. Despite the fact that the crater is only intact on its right-hand side, ESA has credited the lake's existence as an important discovery. The agency pointed out that the visible section of Eberswalde shows unusually well preserved feeder channels descending from the top of the crater down into the delta, indicating the original source of the lake's water. "This delta structure, first identified with NASA's Mars Global Surveyor spacecraft, is characteristic of the presence of a lake in the crater at that time. Such features provide a clear indication that liquid water flowed across the surface of Mars in the planet's early history," wrote an ESA representative in the agency's statement. 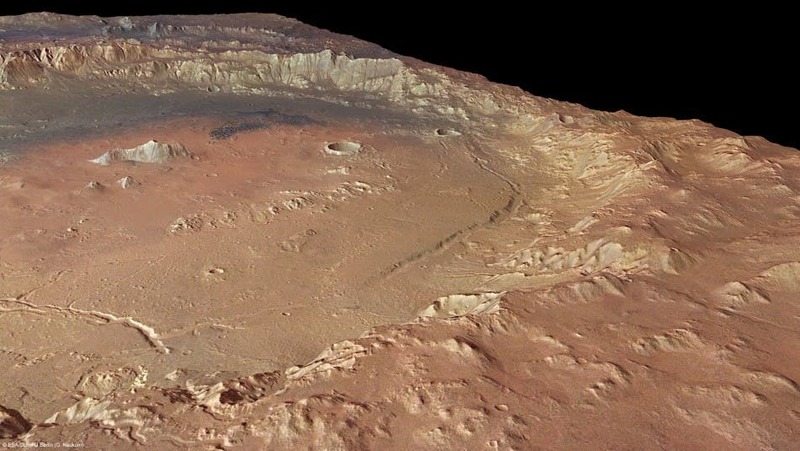 Contained in the Eberswalde crater, the lake's existence was predicted after the Express caught images of a delta on Mars' surface. The delta discovered was a large fan shaped pattern believed to have been formed by deposits within the now dry ancient lake. The discovery of the crater lake,and others, which evaporated during one of Mars' massive environmental changes, has massive implications just by existing. "Most of the research on Mars has focused on its early history and the recent past. Scientists had largely overlooked the Hesperian Epoch as it was thought that Mars was then a frozen wasteland. Excitingly, our study now shows that this middle period in Mars' history was much more dynamic than we previously thought," said Nicholas Warner, Department of Earth Science and Engineering at Imperial College London who along with colleagues suggests that during the Hesperian Epoch, approximately 3 billion years ago, Mars had lakes made of melted ice, each around 20km wide, along parts of the equator. Earlier research had suggested that Mars had a warm and wet early history but that between 4 billion and 3.8 billion years ago, before the Hesperian Epoch, the planet lost most of its atmosphere and became cold and dry. In this study, the researchers analyzed detailed images from NASA's Mars Reconnaissance Orbiter, which is currently circling the red planet, and concluded that there were later episodes where Mars experienced warm and wet periods. The researchers say that there may have been increased volcanic activity, meteorite impacts or shifts in Mars' orbit during this period to warm Mars' atmosphere enough to melt the ice. This would have created gases that thickened the atmosphere for a temporary period, trapping more sunlight and making it warm enough for liquid water to be sustained. 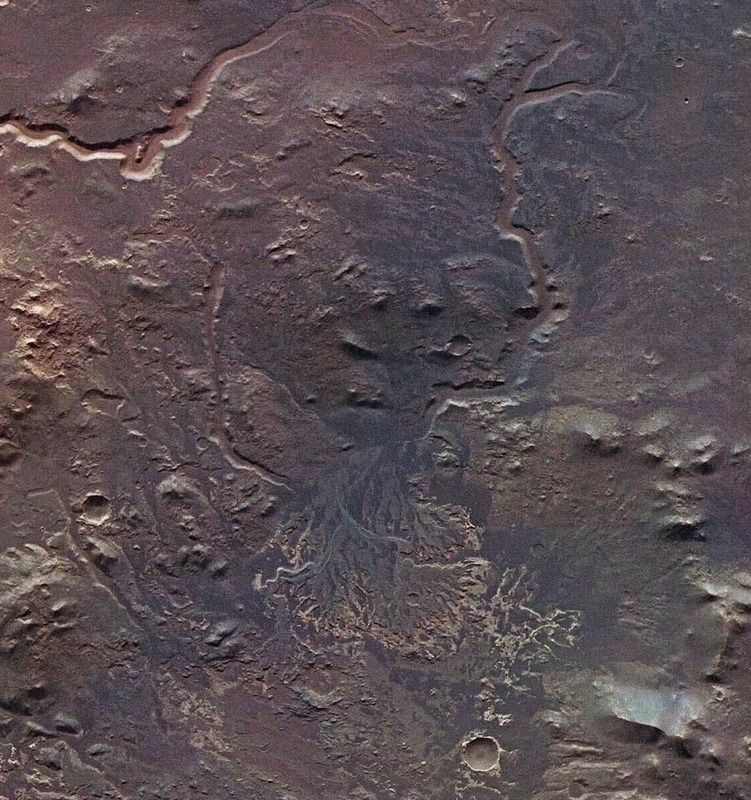 The team used the images from the Mars Reconnaissance Orbiter to analyse several flat-floored depressions located above Ares Vallis, which is a giant gorge that runs 2,000 km across the equator of Mars. The team believe the melting ice would have created lakes and that a rise in water levels may have caused some of the lakes to burst their banks, which enabled water to carve a pathway through the frozen ground from the higher lakes and drain into the lower lying lakes, creating permanent channels between them. "We can now model the 3D shape of Mars' surface down to sub-metre resolution, at least as good as any commercial satellite orbiting the Earth. This allows us to test our hypotheses in a much more rigorous manner than ever before," according to Professor Jan-Peter Muller, Mullard Space Science Laboratory, Department of Space Climate Physics at University College, London. The researchers determined the age of the lakes by counting crater impacts, a method originally developed by NASA scientists to determine the age of geological features on the moon. More craters around a geological feature indicate that an area is older than a region with fewer meteorite impacts. In the study, the scientists counted more than 35,000 crater impacts in the region around the lakes, and determined that the lakes formed approximately three billion years ago. The scientists are unsure how long the warm and wet periods lasted during the Hesperian epoch or how long the lakes sustained liquid water in them. The researchers say their study may have implications for astrobiologists who are looking for evidence of life on Mars. The team say these lake beds indicate regions on the planet where it could have been warm and wet, potentially creating habitats that may have once been suitable for microbial life. The team say these areas may be good targets for future robotic missions. The next step will be to survey other areas along the equator of Mars so that they can ascertain how widespread these lakes were during the Hesperian Epoch.